Wednesday night Jim Boeheim made waves when he called ESPN college basketball reporter Andy Katz an "idiot" and "disloyal" at a postgame press conference. While there were numerous theories as to why Boeheim would explode at Katz in such a way, initial reports were that Boeheim may have been upset over Katz's reporting that night on James Southerland, an Orange player declared academically ineligible. “We got in the room and he put me on camera — there were several witnesses there — and he asked me what I’d told him I couldn’t answer. I kept telling him, ‘I can’t answer that.’ And he asked me, like, 10 times on camera. He never took the camera off me. But Katz did say that he hasn't spoken to Boeheim since the height of the Bernie Fine scandal last season when Katz covered Syracuse's game against Florida at the Carrier Dome on Dec. 2. 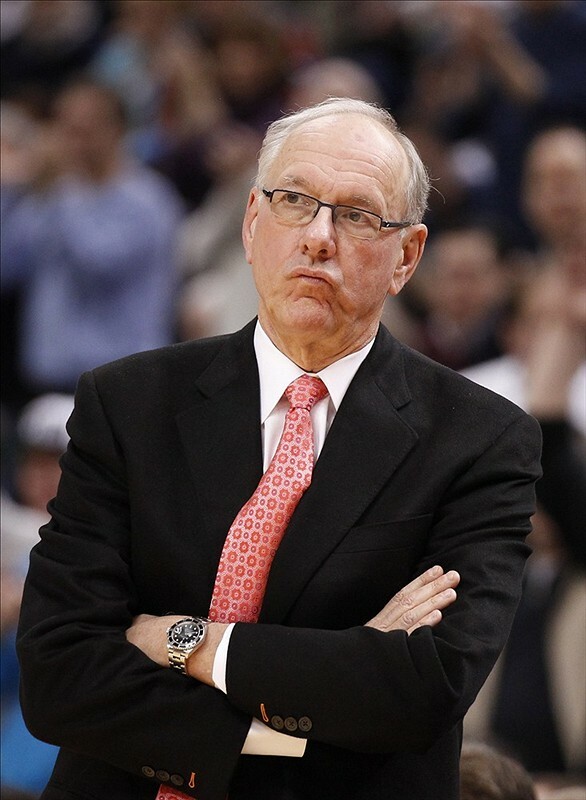 It was after that game that Boeheim offered an apology for his comments regarding Fine's accusers. "I've not seen Jim since that Florida game,'' Katz said. "I've made multiple attempts to get him on various shows. I called him when Notre Dame announced they were leaving the Big East because he's Mr. Big East and he hung up on me. So Jim Boeheim has held this grudge against Andy Katz for over a year because of an interview that went out of bounds? You can question ESPN's role in the Bernie Fine case as we have previously, but at the time isn't it Katz's responsibility to try and get Boeheim to comment on the story? Would Katz be doing his job if he agreed to let Boeheim get away with a free pass when the Syracuse head coach so publicly inserted himself into the story? Or would you rather have Katz agree to those interview conditions at the height of a huge scandal and say, "Yes sir, Mr. Boeheim, whatever you say, let's dig into that 2-3 matchup zone!" Did Katz cross the line and become belligerent by asking dozens of questions? Only a handful of individuals know and right now we only have Boeheim's side of the story as to what exactly happened during that interview. But this doesn't change the fact that Jim Boeheim crossed a line Wednesday night with another press conference bullying act. Boeheim did admit that he shouldn't have called Katz an "idiot" saying "sometimes that happens after games" but let's not pretend like he's actually sorry about that given his past history. It won't be long before Boeheim is trying to lord his power and authority over another media member because of something he doesn't like. His story also makes his "disloyal" comment all the more puzzling. Again, Andy Katz's loyalty does not lie with Jim Boeheim. For Boeheim to publicly try to embarrass Katz because of a year long grudge and Katz doing his job just seems petty and vindictive.